A four-alarm fire erupted inside Trump Tower on Saturday, officials said. A fatal four-alarm fire raged inside Trump Tower in midtown Manhattan on Saturday, killing a 67-year-old man and injuring four firefighters, authorities said. 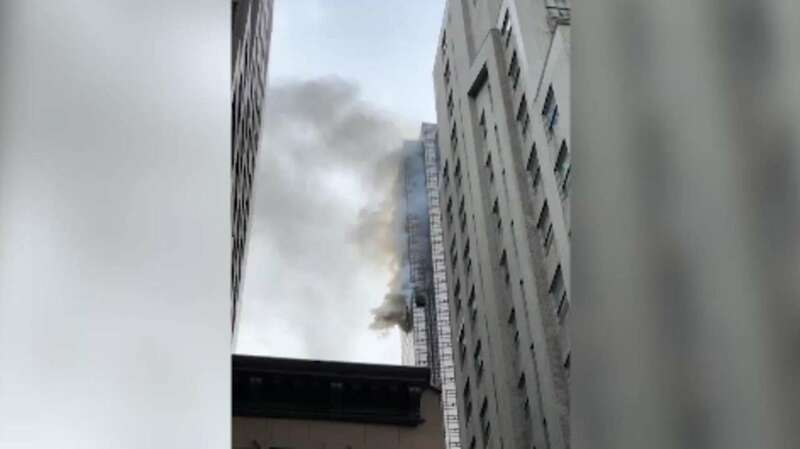 The blaze began inside an apartment at about 5:35 p.m. on the 50th floor of the building on Fifth Avenue, fire officials said. Plumes of thick, gray smoke billowed from the apartment’s shattered windows and into the sky as onlookers gawked at the red flames violently crackling into the air. Debris from the apartment shot out from the window and crashed onto the pavement below as firefighters raced up 50 flights of stairs to battle the blaze. “The apartment was virtually entirely on fire. 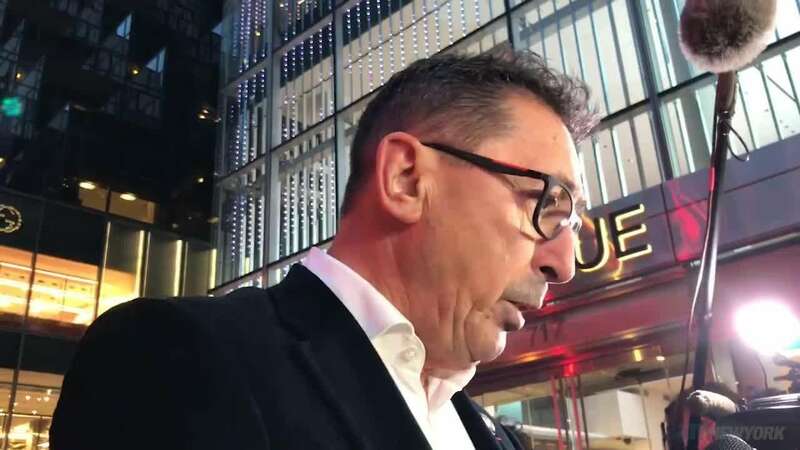 They pushed in heroically,” FDNY Commissioner Daniel Nigro said at a news conference outside the luxury structure. Once inside, firefighters began knocking down the flames and found the seriously injured occupant, Todd Brassner, 67, who was unconscious and unresponsive, authorities said. Brassner was transported to Mount Sinai St. Luke’s Hospital in critical condition. He died a short time later at the hospital, officials said. As many as 200 firefighters and EMS workers arrived at the scene after receiving an automatic alarm, Nigro said. It took firefighters about five minutes to climb the stairs 50 stories to the fire floor, Nigro said. And once they arrived, firefighters had to tap into a standpipe, a water supply source in high-rise buildings that serves the same purpose as a fire hydrant. Firefighters went up with the Secret Service to check the president’s residence. There were no members of the first family home at the time and there was no damage to Trump’s apartment, Nigro said. President Trump was in Washington, D.C., at the time of the fire. Four firefighters suffered injuries that were not considered life-threatening, including two who suffered burns, Nigro said. “It was extremely hot in the apartment. Units pushing in are in great danger, but they do nonetheless,” Nigro said. The fire was snuffed out about an hour after firefighters arrived, Nigro said. Jan Lloyd, 59, and her son, Will Hammond, 18, were visiting from London and sightseeing at Trump Tower when the fire started. 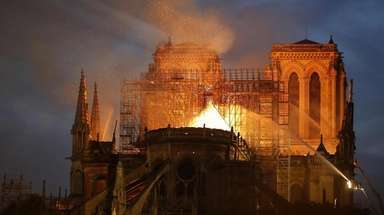 “Ten or 11 of the panels started cracking,” her son said. Eric Trump is an executive with the Trump Organization, which is headquartered in Trump Tower. Fire officials do not yet know what sparked the blaze. The 664-foot Trump Tower has 58 stories, though the top floor is numbered 68, according to The Associated Press. Trump also announced his candidacy for president from the tower in June 2015. Since then, the iconic building has served as a lightning rod for protesters, with surrounding streets either barricaded or closed off for security reasons. NYPD and Secret Service members are now a regular fixture at Trump Tower, keeping protesters at bay. The family occupies the top three floors of the building. The most expensive unit for sale in the building is a 2,509-square-foot three-bedroom, three-and-a-half bathroom going for $18 million, according to the Trump Organization website. The next most expensive apartment is a two-bedroom, two-and-a-half bathroom that sells for $11.5 million. Firefighters were also called to Trump Tower in January for a fire sparked inside the building’s heating and air conditioning system, officials said at the time. Two civilians and a firefighter were treated for injuries that were not considered life-threatening, officials said.